Carnival has announced two new dining concepts for the cruise lines main dining rooms. After testing the new ideas with past guests Carnival Glory will be the first ship in the fleet to introduce the new concepts into it’s dining rooms from December 8th. 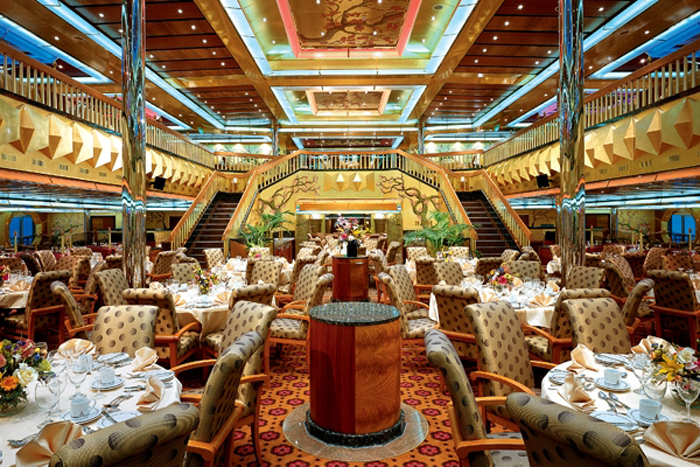 The Carnival Liberty will be the second ship to begin the new dining options in January 2014 then Carnival Imagination and Carnival inspiration will introduce it in February. The new dining concepts will be rolled out to the rest of the fleet during 2014. One of the new concepts introduced is the “American Table” which will be available on casual nights during the cruise. Passengers will be able to experience a modern dining experience with modern American dishes from known regions. The menu will change each time and will feature many creative dishes. The other new concept is the “American Feast Dinner” which will be available to guests up to two times a cruise including elegant night. This concept will make the dining experience more grand and highlight the fact that’s it’s a special occasion. Passengers will be able to choose from a wide range of special dishes including different meats and sea food. Special creative desserts will also be available to make the night even more enjoyable. This will be similar to the popular elegant night dining that Carnival ships already have but will be updated and bring a new experience to guests and now of course the dining event will have a name! Do these two new dining concepts improve the gusts experience or are they just the same as before? Feel free to post your view in the comments below.